Pawn Stars is television gold. The History Channel reality series focusing on the wheeling and dealing that goes on in a Las Vegas pawn shop is one of the highest rated shows on cable television. The network wanted "Antiques Roadshow with attitude." Viewers have gotten plenty of that -- and an education in buying, selling, and pawning. 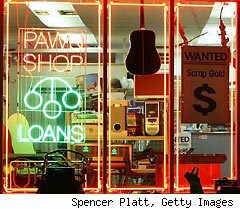 Before Pawn Stars started running on the History Channel, the Gold and Silver Pawn Shop, where the show takes place, had around 100 customers a day. Today business is booming, with around 4,000 visitors each day clamoring to shop, sell, and pawn their possessions. During his lifetime in the business, owner-operator Rick Harrison has seen it all -- everything from a first edition Hemingway to battle plans for the attack on Iwo Jima to Ormolu "Death Clocks." People pawn gold teeth all the time. He's even bought the shoes off a customer's feet. Harrison has enough stories to fill a book, which he recently did in the newly released License to Pawn: Deals, Steals, and My Life at The Gold and Silver. Despite the personal nature of his business, Harrison says sentimentality and business don't mix. No matter what item potential pawners present to him, in the end it's all about making a solid business decision: "A pawnbroker with a heart is a pawnbroker out of business," Harrison said during a recent interview on the The Motley Fool Money Radio Show. 1. Never make the first move. While the majority of The Gold and Silver's business is pawns, the television show focuses primarily on customers bringing in items to sell outright. Some have no idea what an item is worth, and others have an idea -- sometimes unrealistic -- of how much they want for it. Never give the first price. Why throw out there the first price? The second you give the first price, you're always negotiating against yourself. Why tell someone you'll pay them $1,000 for something when you can say, "How much are you looking to get out of it?" and they might say $500? The second No. 1 rule I have is this: Never fall in love with it. I mean, if you have to have it, you've already lost. Always be willing to walk away from a bad deal. 2. Gold may be glittering, but there's money to be made in other metals. Gold prices are continuing to hit new highs. But Harrison says investors should consider taking stock in another precious metal: silver. Right now, I absolutely love silver... more than gold. Gold is just accumulating and the pile gets bigger and bigger. With silver, it seems like every other day there's a new industrial use for it, and the piles around the world have just gotten smaller and smaller. In the early '80s, the U.S. government had 3 billion ounces in inventory. They have none, now. They're a net buyer. As far as an economic play and the dollar falling, I like that. The fact of the matter is supply is not going to keep up with demand on all the industrial uses of silver, so the price has no way to go but up. 3. A good back story puts more money in your pocket. I used to have to go to the library like once a week to research all sorts of weird things I'd buy. I found out a long time ago if you put a story behind something, it's a lot easier to sell it, and you can get a lot more money. The best deal I've ever made was back in the early '90s (this is pre-Internet). A lady came in with four photogravures. (It's a late 1800s/early 1900s photographic process that was really expensive to do at the time.) I could tell right away they were photogravures. They were of American Indians. I knew they had to be worth something -- but what they were worth, I had no idea. So, I took a shot. I gave her $50 for them. Then I go down to the library and start looking everything up. I find out that in the world of American photography, you have Ansel Adams and the next one down is Edward Curtis. These were all photogravures by Edward Curtis, and the negatives were in the Smithsonian. And I got $20,000 for the photogravures. 4. If worse comes to worst, you can always use your bling to pay your bail. Harrison has spent his life in the pawn business and has transacted with people from every walk of life -- everyone from struggling single moms to billionaires. When it comes to jewelry, however, some of the most profitable bling for The Gold and Silver comes from the business brought in by those who make their money working in the world's oldest profession. Pimps always have to have a lot of jewelry. When a pimp is arrested, he's generally arrested for pandering, so any cash he has on him will be confiscated for evidence. But the jewelry won't. So, when he gets arrested, the jewelry is impounded. He sends someone down to pick up the jewelry, which can be taken back to the pawn shop so that they can get money for bail. That's also why pimps always buy their jewelry in pawn shops, because if you buy something in a pawn shop, generally the agreement is you can always pawn it back for half of what you paid for it. Mac Greer is a producer of The Motley Fool Money Radio Show and The Motley Fool's daily podcast, MarketFoolery. This interview was edited for clarity.